Warcraft II: Beyond the Dark Portal is an expansion pack developed by Cyberlore Studios, released in 1996 by Blizzard Entertainment for their award winning real-time strategy game Warcraft II: Tides of Darkness. As with most computer game expansion packs, Beyond the Dark Portal requires a full version of the original game to run. 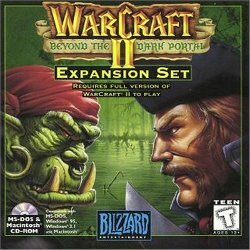 The plot of Beyond the Dark Portal takes place after the events of Warcraft II: Tides of Darkness. The Orcs, now under the leadership of Ner'zhul, staged a new invasion of Azeroth and overwhelmed the citadel of Nethergarde, which guarded the remnants of the portal. The Alliance itself had been splintered after the Second War and Kul Tiras and Stromgarde had withdrawn their support. The arch-mage Khadgar summoned heroes of Azeroth, Alleria Windrunner, Danath Trollbane, Turalyon and Kurdran Wildhammer to rally the forces of the Alliance. The Horde was beaten back and Khadgar decided to take the initiative to push through the Portal into the Orcs' homeland. Before being pushed back, Ner'zhul managed to steal the spellbook of Medivh which was needed to create new Portals. The Alliance gained a foothold and made preparations to seal the rift forever while the Orcs reorganized. Khadgar needed the spellbook of Medivh and the Skull of Gul'dan to accomplish it. They razed the fortress of Auchindoun, seat of Ner'zhul's Shadow Council. While the Alliance army and navy only barely held out, Khadgar managed to acquire the items with help from the Laughing Skull Clan. Ner'zhul managed to open portals to the Twisting Nether and escaped through one of the new Portals. The violent energies began to destroy Draenor and also threatened Azeroth. Khadgar destroyed the Portal on the side of Draenor to prevent harm to Azeroth, trapping the remaining Alliance forces beyond the Dark Portal in the dying land of Draenor. Khadgar and the warriors of Azeroth then entered one of the portals not knowing where it would lead to avoid being killed by the violent rifts tearing the planet apart. With the release of World of Warcraft: The Burning Crusade, it is revealed that the Alliance forces actually remained on Draenor rather than escaping through a portal as said in Beyond the Dark Portal's ending. They are still alive and are currently fighting to prevent another invasion of Azeroth. This page was last edited on 16 August 2016, at 15:27.